Coal, oil and natural gas are fossil fuels. When they are burned, they change the Earth's atmosphere. How is that possible? Coal is a good example. Coal was formed hundreds of millions of years ago. 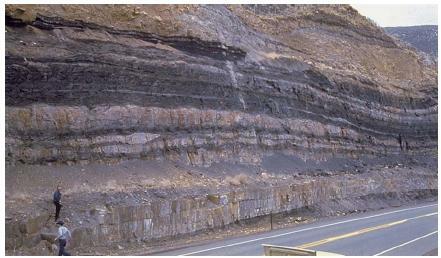 Geologists say that a three-metre (10-foot) coal seam took between 12,000 and 60,000 years to form. Ancient trees and other plants lived, died and were fossilised. All those plants took carbon dioxide out of the atmosphere. 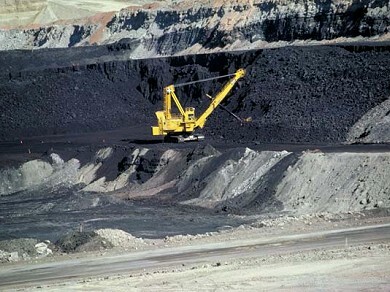 Some larger coal seams are, for example, 10 metres thick. They took around 40,000 years to form, but have been mined and burned in a little over 100 years. The fastest rise of CO2 in the air seen in the ice core record (800,000 years) is 20 ppm in 1000 years. The CO2 level in the atmosphere is now rising at around 20 ppm per decade. The carbon joins up with oxygen when it burns. Each carbon atom joins with two oxygen atoms to make a carbon dioxide molecule. As a result, oxygen concentration in the air is slowly reducing. Data recorded at Cape Grim Station, Tasmania. No need to panic, however, as the reduction is around 2ppm per year. The atmosphere contains 210,000 parts per million of oxygen, so the reduction in oxygen has little direct impact. It does, however, confirm that the extra CO2 is being made by burning of materials containing carbon, which combines with atmospheric oxygen.